The book 'A Bicentennial History of Van Buren County, Iowa' has this to say about our Mormon history: "Historians agree that , in marked contrast with citizens of neighboring states, Iowa never joined in the persecution which Mormons endured in their early years. Rather, Iowans enjoyed their music, made use of and paid fairly for, their skills and labors. Many well built homes remain here, attesting to this." David Moore writes: "On the eighth day of May 1846, I left Nauvoo and crossed over the Mississippi river, and camped on the west bank of the river for the night. Solomon Conley was engaged by me to haul my effects to Bentonsport, Van Buren County, Iowa, some 35 miles from Nauvoo. My health was still very poor from the sickness I had in the fall before. We arrived in Bentonsport on the 12th of the month, it taking us 4 days or nearly so to make the trip. On our arrival in town, I inquired for a room or house to rent, but found none. I then moved on to the upper part of the town and camped by or on the bank of the Des Moines River. 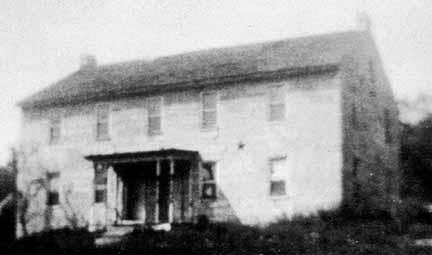 On the second day after I crossed over to South Bentonsport where I obtained a room in a house belonging to John Smith. I soon got some small jobs of work which was a material aid to me in the destitute circumstances in which I was at the time. I then went to work at wagon making and cabinet making and any kind of wood work that I could do for a living and continued to do so while I lived at Bentonsport, which was a little less than three years. On the 24th of Nov. 1846, I left John Smith's house and moved into one that Br. Jas. Lithead ( James Leithead) and I had built together on a lot belonging to Geo. C. Allender. Br. Lithead also moved into said house with me. I lived in this house until the 4th day of April 1848. I moved from this house to a house that Br. W.G. Wilson had built for which I had to pay one dollar per month rent. I lived in this house until 19th of July when I moved into a house that was built for a Grocery, where I lived until I left for Salt Lake Valley." James Leithead writes in his Journal: "While at Nauvoo I labored much on the Temple from the start until completed. I was a bass drummer in Marshall Band. Built a large frame barn for Hyrum Smith and did other work for him, was intimately acquainted with him and his family. In the spring of 1846, myself and two others hired a flatboat and ferried the Saints across the Mississippi River, and in June hired a team to take us to Bentonsport on the River Des Moines in Iowa. I stayed there until I made an outfit to cross the plains, and in 1849 I left Bentonsport for Kanesville and in 1850 crossed the plains in Captain Milo Andrus' company of over 50 wagons, arriving in Great Salt Lake City in September." In his Autobiography, James Leithead writes: "Myself and others hired a flat boat and when spring opened, commenced ferrying across the river, which we continued until the majority were across. Having no team and wagon for the trip, I hired a man and team to take me and wife to Bentonsport on the Des Moines River in Iowa. I there went to work, getting considerable work in a large flour mill. I also joined in with a brother of the mill owner, a cabinet maker and made large quantities of bedsteads and other furniture and shipped it up and down river. I worked also making wagons, anything to make an outfit for the journey across the plains to the valley of the Great Salt Lake which the Pioneers had found and located in." James and Deborah Leithead's daughter, Ann Cross Leithead, was born here in Bentonsport on April 7, 1848. In "A Short Life Sketch of Celia Anzenette Keyes Taylor", (daughter of Elisha and Johanna Keyes) Celia Keyes writes: "The teams were weak and the roads muddy so we could only go a few miles in a day. The team took us as far as Bentonsport. There we found some very kind people. We stayed there two-and-a-half years. Father and Mother both got work and we soon began to get some of the comforts of life around us." Eliza Rawson wrote in her Autobiography: "In the spring of 1846 we left Nauvoo and went to Bentonsport on the Des Moines River. Here my parents lost a little girl. We lived here two years. We then moved to Winter Quarters where we remained one winter and then moved to Missouri near Saint Joseph. Here Mother gave birth to another son." Joseph Terry, son of William Reynolds and Mary Allen Phillips Terry, born 6 June 1842. John Lamb Freeman, born August 1842. 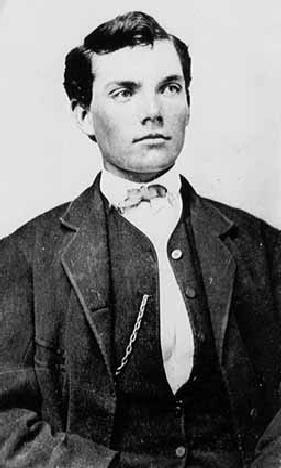 James Edward Seward, son of Byrum P. and Nancy Carter Seward, born June 1846. 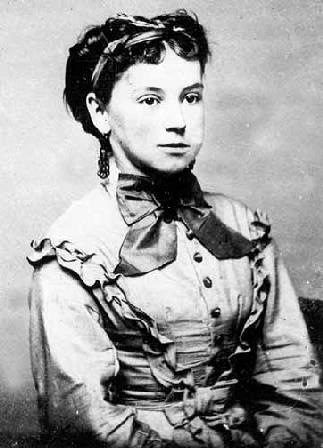 Married Edith E. Benedict, 15 September 1872. Died, July 1936, in Bentonsport, at 90 years old. Joseph Morehead Thomas, son of Daniel and Ann Morehead Thomas, died 17 September 1846 at 35 years old. Sarah Turpin, daughter of William and Elizabeth Tidswell Turpin, born 3 December 1846. Sarah Ann Keyes, daughter of Elisha Barrus and Johanna Case Keyes, born 10 February 1847. Mary Jane Higley, daughter of Myron and Priscilla Eberson Higley, born 13 February 1847. Ann Cross Leithead, Daughter of James and Deborah Lamereau Leithead, born 7 April 1848. James Whitford Dack (or Doak), son of William and Jane Code Dack (or Doak), born 3 October 1848. Elisha Barns Keyes, son of Elisha Barrus and Johanna Case Keyes, born 28 November 1849. Martha Jackson, daughter of Joseph and Nancy Ann Cluff Jackson, born 1851. Susannah Jackson, Daughter of Joseph and Nancy Ann Cluff Jackson, born 1853. William Leeka, of German descent. He joined the Church of Jesus Christ of Latter-day Saints on 12 March 1840 at Bentonsport, Van Buren County, Iowa, being baptized and confirmed by Joseph Ball and Truman Gillette when he was 10 years old. He married Rachael S. Seward on 28 May 1873. 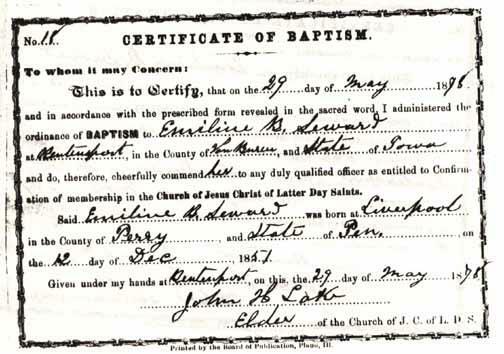 Mary Elizabeth Seward, baptized at Bentonsport on 26 June 1868 when she was 31 years old. John L. Seward, son of Byrum and Nancy Carter Seward, born in Bentonsport in 1849. 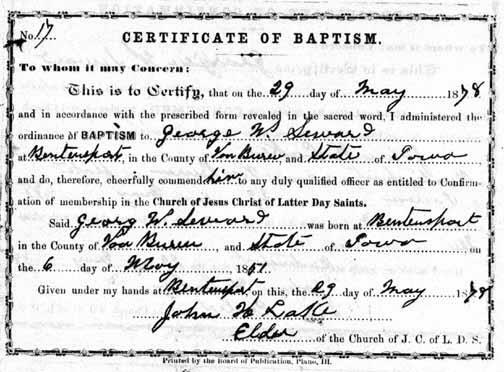 George W. Seward, son of Byrum and Nancy Carter Seward, born 6 May 1851 in Bentonsport, baptized 29 May 1878, married Emma B. Mitchell in 1878. Nancy Carter Seward, daughter of David and Nancy Carter, died April 1878 in Bentonsport at 66 years old. If anybody else has a journal entry or anything by a pioneer ancestor which mentions Bentonsport, Iowa, please donate it to this history record. We would be very grateful. You can email us at Stay@MasonHouseInn.com . This building in Bentonsport has always been called "The Mormon House". Verbal history has that it was built by Mormons in 1846 as a two-family home (it is a duplex). At one time it was also used as a plow or wagon factory. Made of limestone blocks, cut locally, today it is a one-story structure and can be seen at the north end of Sanford Street. It is owned and maintained by the Bentonsport Improvement Association. Emmiline (Emma) B. Mitchell Seward and George Seward were Mormons who lived here in Bentonsport in 1878. In the terrible aftermath of the exodus from Nauvoo, the Mormon pioneers endured hardships beyond human endurance. Many people died that first year of 1846. Some of the Saints crossed the Mississippi River in the winter while the water was frozen, and had to endure the freezing temperatures on the opposite bank in tents and covered wagons not built to keep out the cold. Many people froze to death. Other people waited to cross the river on ferries in the spring. But then they found themselves on muddy banks covered with mosquitoes. The rain and cold led to cholera and diphtheria, killing many more. Those who survived were weakened by the sicknesses. Those whose spouses and children died, went on in spite of their mourning. The Saints who were prepared for the trek, followed Brigham Young to Salt Lake City, Utah. Those who were not yet prepared, needed to move to a town where they could live and work and get their supplies together. Bentonsport was one such town. Already having an established Mormon community here, more Saints were drawn here to live and work. Pioneers like David Moore, James Leithead, Elisha Keyes, and many others worked in the shops and mills. They built houses and other buildings still standing today. Some of those buildings that are linked to the Mormons by verbal history are the Mason House Inn, the Montgomery House, the Mormon House, and the original part of the Julius Greef House. The National Trails System of the National Park Service has a booklet called "The Mormon Pioneer Trail Across Iowa in 1846". This is what they have to say about Bentonsport (pgs. 22 and 23): "Bentonsport, Iowa boasts a number of buildings constructed by Mormon emigrants who stopped and labored to earn money for their trip westward. One of these buildings is the Mason House Inn, which retains its original 19th century furnishings. Tours of the inn and a self-guided walking tour of the district are available." www.mormontrails.org says: "The Dragoon Trail was used extensively throughout the main period of the great migration across Iowa from 1846 through at least 1853. This trail was purposely blazed in 1835 by the First U.S. Dragoons under Colonel Stephen W. Kearny, who had been ordered to locate a site for a new fort near the confluence of the Raccoon and Des Moines rivers, on the site of present-day city of Des Moines. By 1846 the colonel's trace had become an important road into the trans-Mississippi interior, a fact not unknown to the Mormons. From Montrose, the Dragoon Trail angles northwest via Charleston, Bonaparte, and Bentonsport. The trail proceeds northwest to Libertyville, Ottumwa, Pella, and Monroe. From here the trail turns south west across Warner, Madison, and Adair counties to Lewis in Cass county, where it intersects the Pioneer route of 1846." 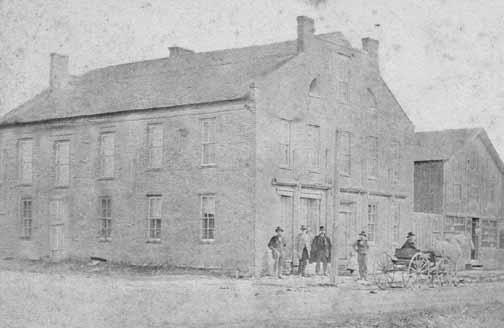 The Iowan magazine, in the July/August 2008 issue, has this to say about the Mason House Inn: "The Mormons left their mark in many places along the original route used by the first pilgrims in 1846 and 1847. In Bentonsport, a major port on the Des Moines River, Mormon craftsmen built the Mason House Inn, which still operates as a bed & breakfast." Many of the Mormons left Bentonsport when they had acquired enough supplies to make the trip to Salt Lake Valley. However, some of the Saints stayed here, continuing to work in the mills and shops and some owned farms in the outlying areas. Some of the buildings erected after 1849 in Bentonsport, were built in the distinct style of the previously mentioned buildings. These are the Sanford House, the James Brown House, the Cowles House, the Herman Greef House, and the Odd Fellows Hall. There is also a little brick house on Quail Drive in Vernon (formerly South Bentonsport). All of these buildings look as if they could have at least been influenced by the Mormon craftsmen who came here so long ago and left their mark for all eternity. For more information on the history of the Mormon trail, see www.beautifulnauvoo.com . And if you are planning to visit Nauvoo, Illinois, you won't want to miss Bentonsport and the Mason House Inn.